The question on the 35th day of the Donald Trump border wall government shutdown is…. With Donald Trump sign off on anything the Senate leaders come up with? Will House Democratic Speaker Nancy Pelosi also? Or is this just an effort by the two US Senate party leaders to make themselves look good in the media and the public? Chuck Schumer emerged from Mitch McConnell’s office after a 30-minute meeting on Thursday afternoon bearing a wide grin. “We’re talking,” the Senate minority leader said as he walked back to his office. After five weeks of mostly radio silence, with Washington reeling from the longest government shutdown in U.S. history, the two party leaders are finally in a room together. And it might be just what’s needed to, eventually, end an impasse sparked by President Donald Trump’s long-running quest for his border wall. 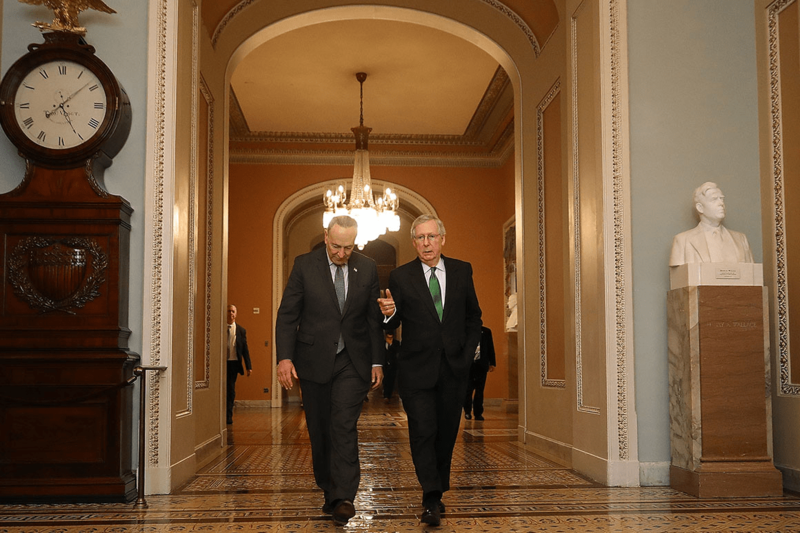 Majority Leader McConnell (R-Ky.) and Schumer (D-N.Y.) have talked often as they’ve run the Senate for the past two years, but the shutdown has brought a chill to their relationship. After Trump announced his plan to fund the wall and reopen the government on Saturday, it wasn’t until Tuesday that the two leaders spoke in depth about how the Senate would handle it, according to multiple sources. But after they did, the Senate finally came alive. McConnell and Schumer set up two votes, one on Trump’s proposal, the other on a Democrat-backed spending bill, that both failed Thursday. The pair of doomed votes, however, is already spurring movement — demonstrating that neither the president nor the Democrats are likely to get everything what they want in the end and leading to the meeting in McConnell’s office. McConnell and Schumer call each other friends but have yet to truly get in sync with each other as party leaders over the past two years, aides and senators say. But now lawmakers hope the two longtime Capitol Hill operators may actually produce a solution to the stalemate, provided they can get buy-in from the president and House Speaker Nancy Pelosi, which won’t be easy. “I really think those two are trying. I’ve talked to both, individually, and they both want something to happen,” said Sen. Joe Manchin (D-W.Va.), who is a member of Schumer’s leadership team and the rare Democrat who speaks with McConnell privately. “If it was left to Schumer and McConnell we wouldn’t be here. People would be working.”….